Social Networking offers ease of connecting with people (friends, family, faculty members, business prospects etc) round the clock. There are uncountable numbers of social networks; you can use a selected few or as many as you wish. Using one such social network you can make new friends, share ideas & interests and learn new things. The mobile internet is reaching to everyone and use of Social Network is absolutely free. Students can make use of social network to share class notes and presentations etc among peer study groups. Also use of Social Networking is highly popular among business executives and product marketers. The other name of Social Networking is Digital Networking. To make connection using social network you need a computing devices connected with internet. 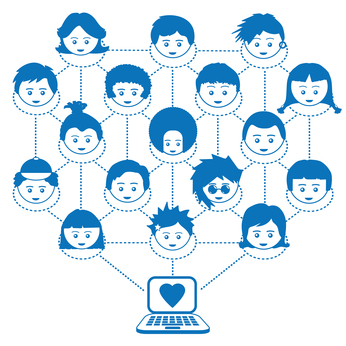 The Social Networking Programs like Facebook etc groups people on the basis of location, common interests, education, schools and employment skills etc. The websites those provides digital networking services are termed as Social Media or Social Media Sites. The use of social media is massive world over. No field is untouched from one or other kind of social media. According to Kaplan Inc, in the year 2012, 26% College Admission Officers used Facebook to scan applicants. Social Media has seven building blocks called together the Honeycomb Framework of Social Media. These are: Identity, Conversation, Sharing, Presence, Relationships, Reputation and Groups. A social media may use only few or all of the seven building blocks. We will discuss about this framework in detail in later part of this chapter. The use of social media to connect with friends, family, classmates and customers or to meet new people is called social networking. People use social media for social or business purposes or both. Some of the popular examples of social networking websites are: Reditt, Facebook, Twitter, Instagram, Google Plus, LinkedIn etc.